Space Chantey was published as an Ace Double. 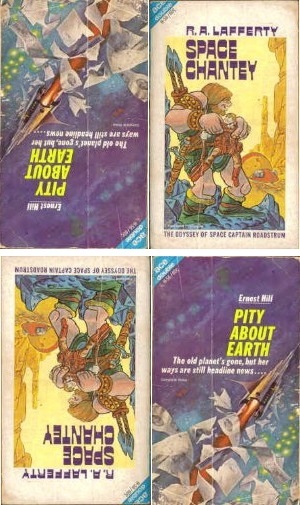 One half the book being Space Chantey by R. A. Lafferty, the other half being Pity About Earth by Ernest Hill. Having read, re-read, and greatly enjoyed Space Chantey, I finally got around to flipping the book over and reading Pity About Earth. I was actually surprised by the book. It is written in an over-the-top style of prose with the few human characters being amoral and unlikable. The best description of the writing style would be The Man Who Never Missed meets Caligula. However, the book is based on an intelligent idea, and there is reason for the portrayal in such broad, clichéd, yet unpleasant prose. The main character, Shale, fights, kills, debauches, and loafs his way through every situation with no thought for anyone but himself. There starts to be a sub-plot where he begins to care for a half-simian hybrid girl, but in the end his personal inertia is too great to overcome a lifetime of uncaring amorality. And that's the point. The book reveals itself to be about how humanity has allowed mechanization to take over every aspect of life, making human beings superfluous. The machines, as a means of self-preservation, have created a stagnant culture, where people have nothing really to do, yet believe they are still important. The amoral, devil-take-the-hindmost attitude of society keeps the humans busy so the system can trundle on unimpeded. The prose of the first half of the slim novel, far from being unnecessary hack-work, is actually necessary hack-work, illustrating the kind of society and characters that can exist in that mechanically maintained world. Space Chantey is the superior of the two novels in this Ace Double without question. I imagine they picked Pity About Earth to pair with Space Chantey because of the over-the-top silliness in the prose of both. However, while the overblown SF clichés of the Ernest Hill novel illustrate a point, it is also mildly unpleasant and forgettable. Lafferty, on the other hand (literally on the other hand, depending on how you're holding the book), uses his even sillier outrageous prose somehow to give the tale greater depth and universality. I was never that impressed with the Hill, but maybe that's just me unfairly wishing I was reading more Lafferty instead. Of course, the pairing is as much marketing as thematic: joining a well-recognized and in-demand author, Lafferty, with an unknown. You can see that almost across the board with the Ace Double format. It is kind of neat though, and striking on a shelf. And they published a lot of things that you just can't get elsewhere, some of which (the Dicks in particular) are quite valuable today. I would not have been impressed with Pity About Earth, except that I found it to have been based on an intelligent idea. It was about 30 pages from the end when I realized what he was talking about. Then he had what appeared to be the courage to allow his main character to stay stagnant--further illustrating his point. On the other hand, I found the prose both unrelenting and tedious. It cannot be compared with Space Chantey from any perspective, but taken on it's own terms, I can at least appreciate what Hill was trying to say. On page 52 (not quite halfway) and I'm about to give up on it. I was feeling generous toward it, but the clipped speech of the Groil irritates me to no end. This is the smartest most evolved creature in the galaxy and it can't speak in complete sentences? Rubbish. Several straight paragraphs of the groil talking about his plans for the next stage of collective evolution and I'm ready to kill him myself. It's not at all terrible, but I know what I like and I've finally gotten to the point in my life where I don't feel like I have to finish books just because I started them. I think I'm going to skim a little, then move on. Good review, Kevin. Based on my half-read, I think that your assessment is fair and spot-on. "The prose of the first half of the slim novel, far from being unnecessary hack-work, is actually necessary hack-work, illustrating the kind of society and characters that can exist in that mechanically maintained world.... However, while the overblown SF clichés of the Ernest Hill novel illustrate a point, it is also mildly unpleasant and forgettable." Mildly unpleasant is right. I'm not sure, though, if Hill is self-conscious about this and making the stylistic choice which you give him credit for or if he thinks he's having a great rollicking time while detailing the shortcomings of his fellow man. And it's hard not to read him as being angry specifically about the world as he perceived it in the late 60s.